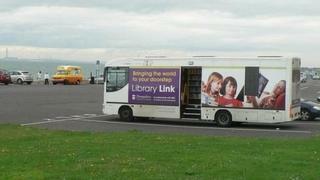 Hampshire is looking to close some of its libraries and cut its mobile library service altogether. Some of its 48 libraries, which in total cost £12m to run, are under threat as the council looks to save £1.7m by 2020. The county council said more than 100 of its mobile stops had fewer than four customers and it cost £161 per person who used its mobile service. A public consultation on the proposals will run until 16 January. Hampshire County Council wants to divide its library service into four tiers, with the most used in the first tier. The lesser-used libraries in tier three, such as at Bishop's Waltham, Emsworth, Odiham and Yateley, may close. Others may become community libraries, which are managed by community organisations, such as those at Burlesdon, Stanmore and Kingsclere. Proposals also include axing the entire mobile library service, which the county council calls "by far the most expensive part" of its library service. The county council said: "The mobile library vehicles are nearing the end of their leases and we have to decide whether or not to replace them." The mobile service costs £360,000 a year to run and used by 2,230 people, which is less than 1% of Hampshire's library customers. Other cost-saving proposals include increasing the use of trained volunteers to support the work of paid staff, and sharing library buildings with partner organisations. The county council also wants to modernise libraries by spending £2m over four years on new technology.